Kick off Sunday football with Easy French Dip Sliders. Score one for the team by serving these cheesy sliders made with Sara Lee® Angus Medium Roast Beef, provolone cheese and au jus gravy dipping sauce. 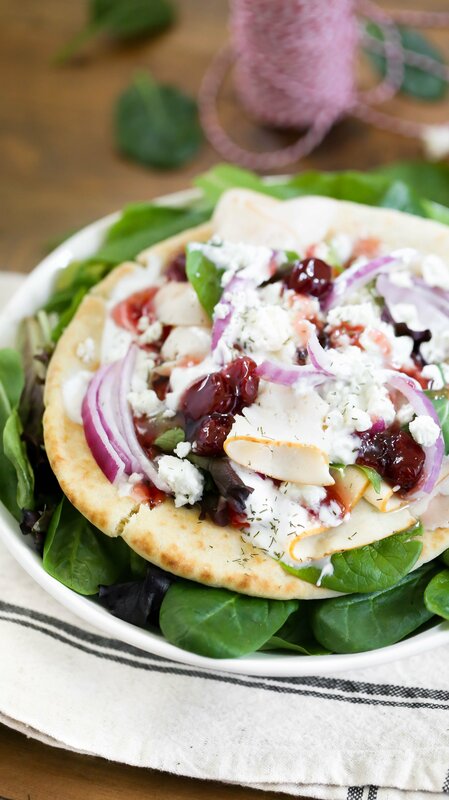 Have this game day appetizer on the table in under 30 minutes. As the football championship gets closer, I’m planning ahead and making quick game day sliders for the big day. It’s a fun way to make a meaty dish and it doesn’t take long to prepare. Food is a universal language that brings people together. It’s something we are all familiar with, and it’s something that traditions can be formed from. When it comes to hosting a party, food and good company are the most important things to keep in mind. Food is much more than impressing someone, but rather something pleasurable we can all relate to. 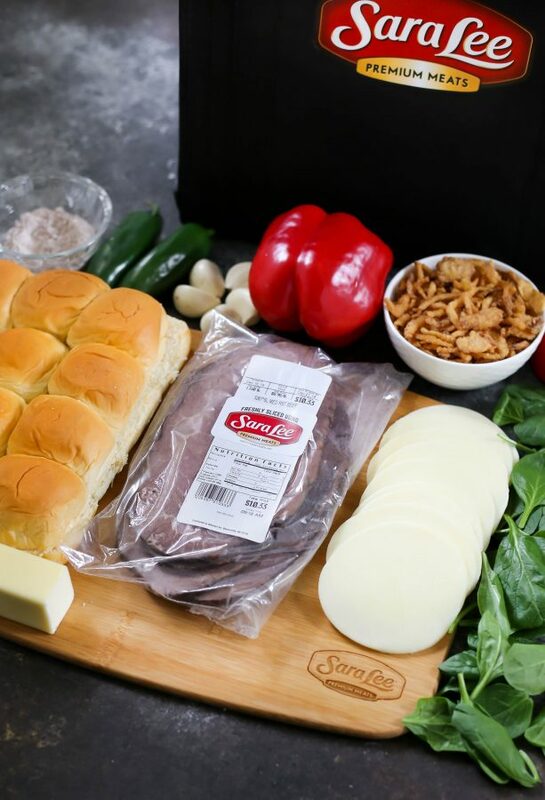 Easy appetizer recipes are at the top of my list and I always use Sara Lee® Premium Meats for their delicious fresh taste to make the best-tasting appetizers and sliders. 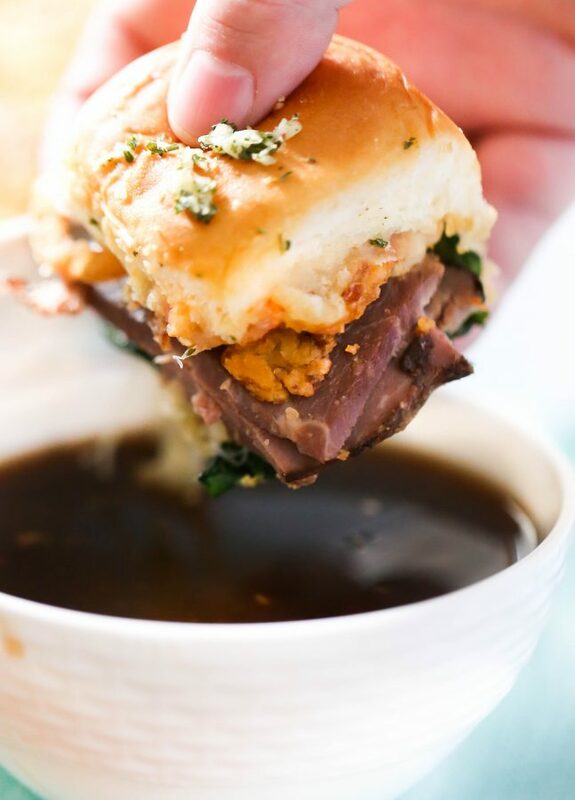 For a quick game day recipe, try these Easy French Dip Sliders. This meaty appetizer takes 10 minutes to make and 15 minutes to bake. Serve these sliders at your own football-watching party and everyone will thank you! The sliders can be made in advance and transported to an office party or neighborhood get together. Everyone raves how delicious these Easy French Dip Sliders are. By the end of the party, there won’t be any leftovers. 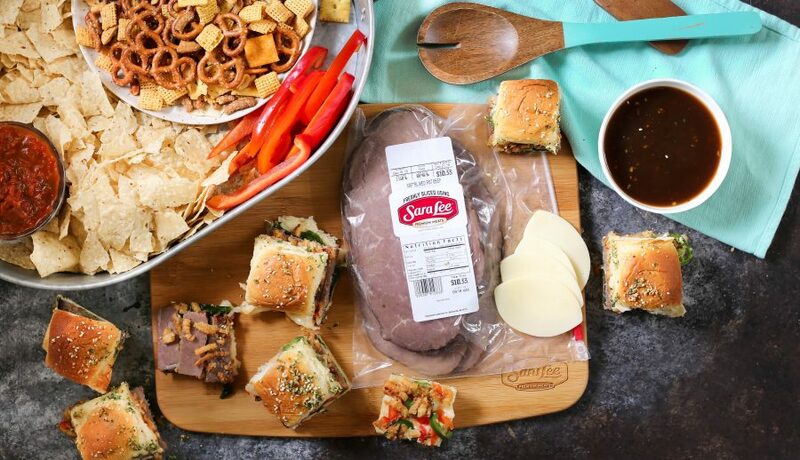 Sara Lee® Premium Meats is my go-to deli meat behind the deli counter. In fact, you’ll find a variety of their premium, high-quality cut of meats has a delicious fresh taste. I always pick up a few freshly-sliced, affordable and premium quality flavors to include in a game day spread. 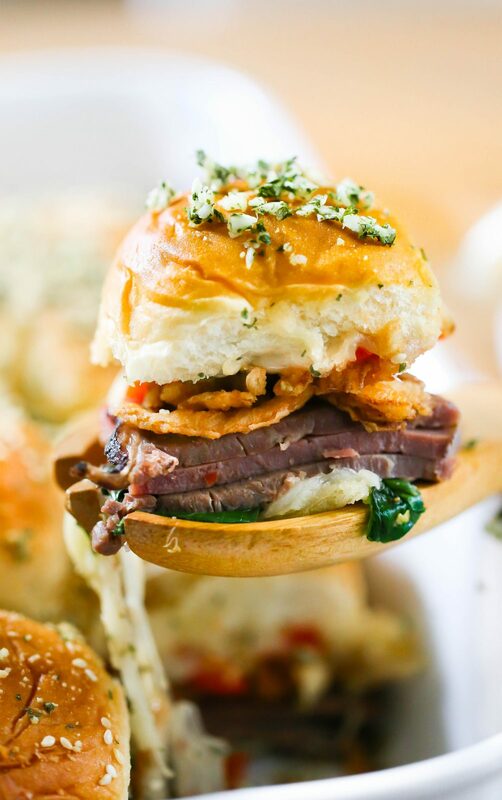 For a quick game day spread using Sara Lee® Premium Meats, I like to make these Easy French Dip Sliders. Other quick recipes that incorporate Sara Lee® Premium Meats include a giant cheese ball with ham, homemade sheet pan pizza with diced ham and pineapple, Cheddar Jalapeno Ham Cornbread, Ham and Cheese Pinwheels and a charcuterie platter featuring a variety of trending Sara Lee® Premium Meats flavors and cheeses. Food is what brings us together. Be sure to have plenty of it for game day! Every game day party needs a meaty slider recipe. What are your must-have appetizers for game day? 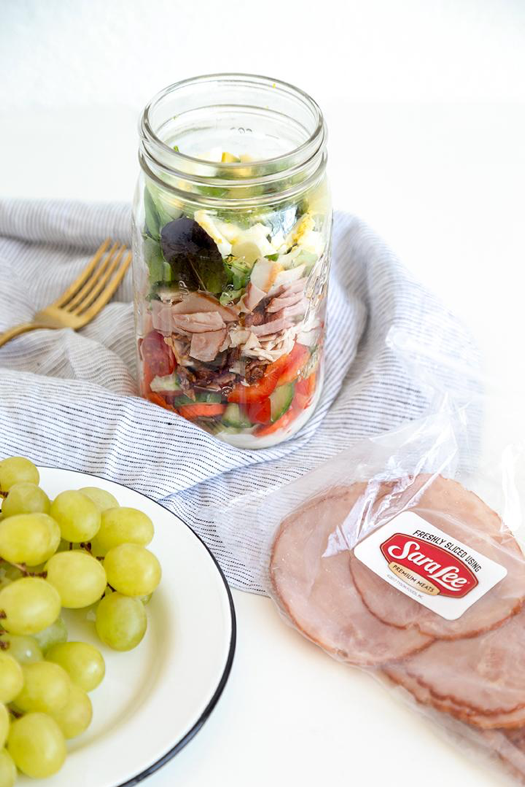 For delicious recipes, your whole family will love, how-to videos, meal hacks and more and easy recipe solutions, visit the Sara Lee® Premium Meats website! 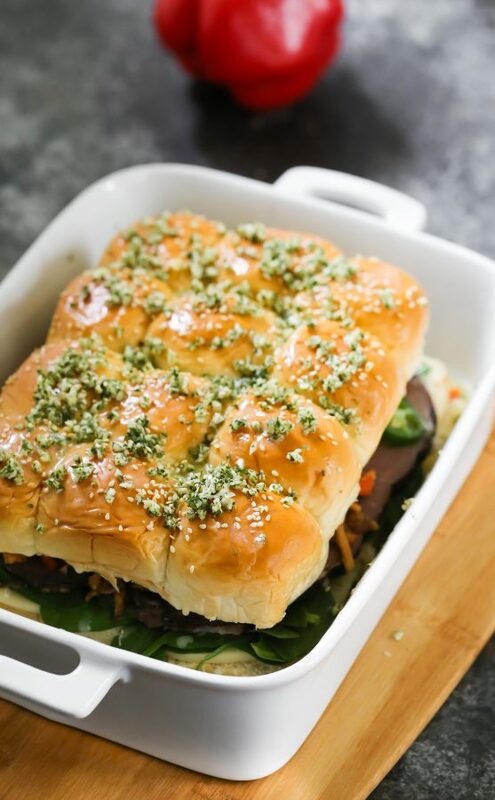 Easy French Dip Sliders made with Sara Lee® Angus Medium Roast Beef, provolone cheese, diced vegetables and served on hot slider rolls. Paired with an easy au jus gravy everyone will love. Melt 2 tablespoons butter in microwave. Spread butter in 9 x 13-inch baking dish or rimmed baking sheet. 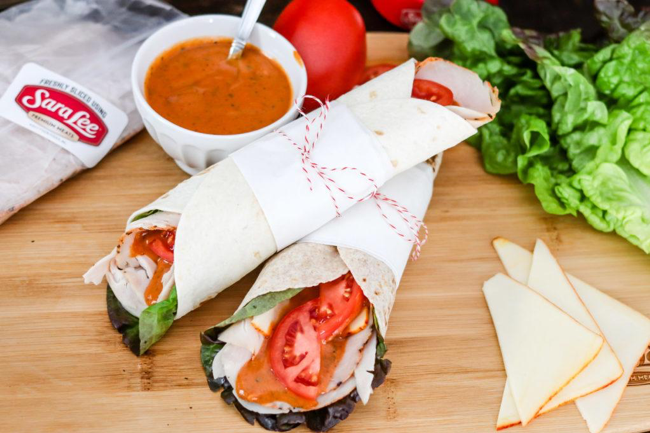 Slice sandwich rolls in half without separating them individually. If they are separated individually already, simply slice them open. Place bottom half of bread rolls on buttered pan. Top with 6 slices of provolone cheese. Evenly spread spinach on top. Top with Sara Lee® Medium Roast Beef. Evenly spread french fried onions across the top. Spread sliced jalapeños and diced red bell peppers on top. Top with 6 slices of cheese. Place the top of the sandwich roll on top. Mince garlic and mix with dried parsley. Melt 2 tablespoons of butter in the microwave and spread it on top of the buns. Evenly spread garlic-parsley mixture across top. Bake in oven for 15-20 minutes, or until warm and cheese has melted. In a small saucepan, combine cold water and au jus gravy packet. Whisk over medium heat until mixture comes to boil then simmer on low for 10 minutes. Stir in soy sauce. Remove sliders from oven and allow to cool slightly. Slice with knife and serve with au jus gravy for dipping. To reheat the sliders, place them in a casserole dish and cover with foil. Place in them in a 300º F oven for 20 minutes.